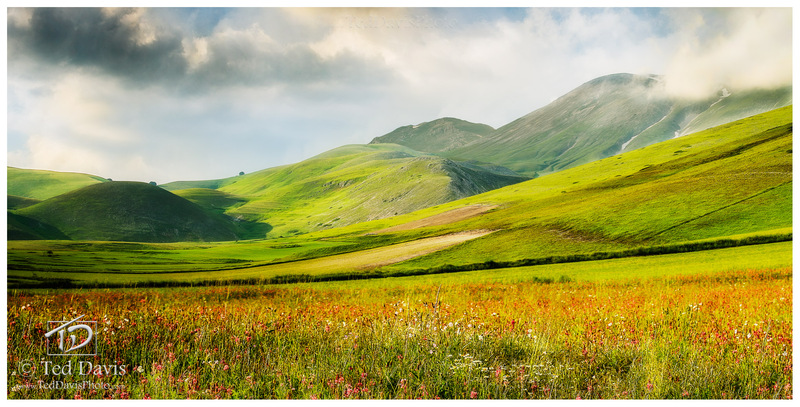 Situated on a hill in the middle of a 2,000 meter high valley, Castelluccio is the quintessence of ‘secret vale’. It is truly remarkable to actually see it with your own eyes. Stretching kilometers in to the distance, the surrounding valley is closed in by rolling hills leading to towering glacial mountains. Walking amid the pastures of the valley, the clouds and sunlight were bursting with drama. With sun beams bursting through one moment followed by a heavy cloud quickly darkening the scene, I battled to get the correct exposure while the winds lightly kissed the valley floor. With a field of wildflowers before me, I finally found the right composition and settled in to wait for that perfect moment when the sun, clouds and wind all gave way to a beautiful scene. High in the Italian mountains, I found the Field of Light. Photo © copyright by Ted Davis.